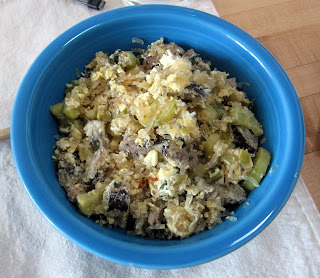 A tasty, crunchy, salty, cheesy salad, made with stuff we had lying around in the fridge. 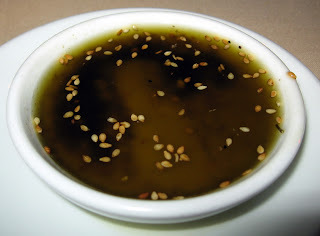 Mix the lemon juice, balsamic, olive oil and mustard to make a dressing. Pour over all of the ingredients except the greens and coat thoroughly. Spoon over mixed greens. Tasty, rich and packed full of veggies. We were on our way to Brick, a place we'd been to and liked before, when we realized that Saha, a place we'd been meaning to try for a while, was right next door. We were seated in less than 10 minutes, despite having made no reservation. The service was very friendly, however, it was a bit slow. They seemed understaffed, which may have been the case since this was the beginning of a long holiday weekend. The decor was chic and sophisticated without being stuffy. Giao and Alexis each ordered the prix fixe menu, which included choice of soup of the day or salad, a small plate and an entree for $35. It was quite a good deal seeing as the cheapest combination of those dishes was at least $40 and our options included just about everything on the menu. Also, it was an even better deal for us, since most 3 course prix fixe menus include a dessert as the third course, which we generally choose not to partake in. 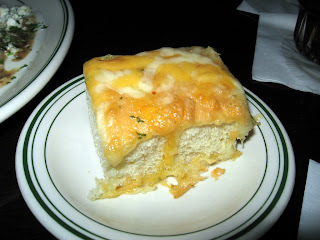 Overall the food was good, but I think we'd stick to small plates if we go a second time. 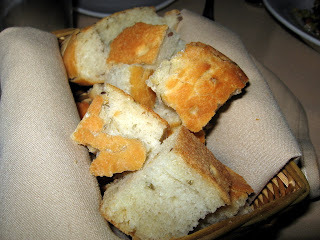 This bread smelled oddly sweet, although it didn't taste sweet. 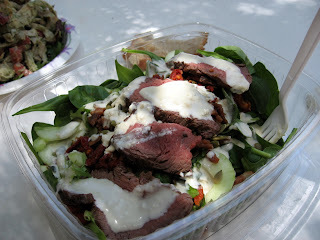 This salad was a pleasant surprise in that the dressing was not nearly as sweet as once would have expected. 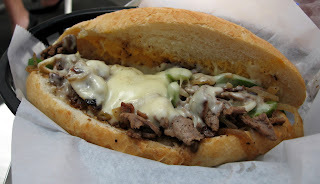 The ingredients were fresh and all of the flavors melded well. 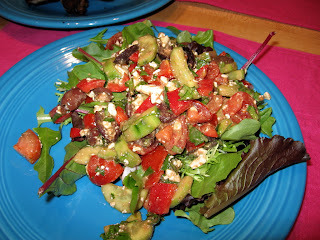 A chopped salad with tomatos, onions, feta, kalamata olives and quinoa, dressed with a rather tart combo of lemon juice and olive oil. Pretty tasty. 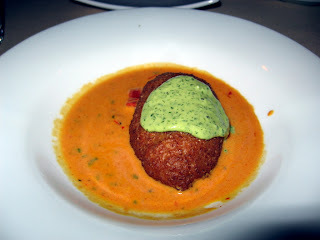 This cracked wheat dumpling liberally stuffed with crab and shrimp was quite delicious. Served over a thin layer of lobster bisque and topped with a tart, herbacious sauce, this was Alexis' favorite dish of the meal. 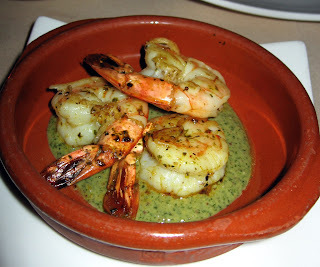 These simply prepared prawns were fresh and not overcooked at all. The buttery, garlicky, herby dipping sauce was finger-licking good, literally. 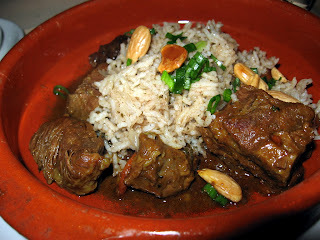 Tender beef in a stew of prunes and almonds, this was a bit too sweet for our taste. 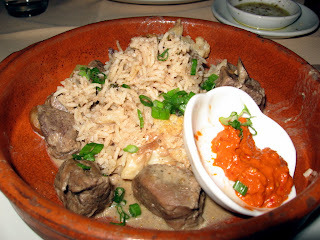 Tender cubes of lamb and caulflower in a yogurt based sauce. 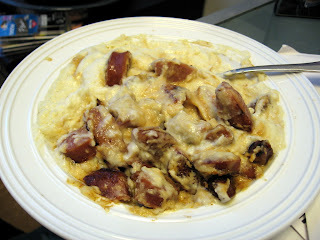 The harissa added quite a pleasant kick, and this dish was ok, but it wasn't a standout. 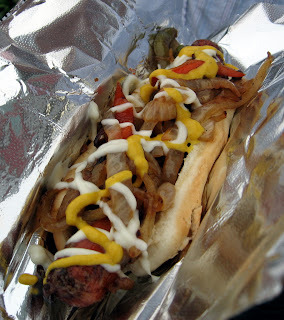 We'd heard of the famous bacon dog stand in the Mission, but we'd never happened across it. We were walking down the street and Giao was hoping out loud that we might walk by the bacon dog stand, when all of a sudden we did. We bought one on the spot. What could be better than standard foremeat wrapped in bacon, then grilled and topped with your choice of condiments. 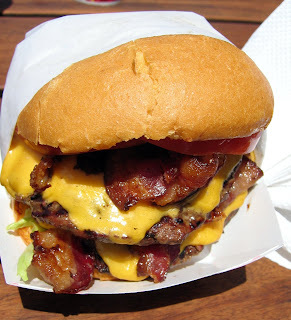 Heart attack in a nice paper wrapping. Pretty good today. Alexis had lunch with an old friend who was in town briefly. She'd been to Rocco's once before and it was a pretty hearty breakfast. At 10:30 am on a weekday though, the ambiance left something to be desired. We were the only customers and 80s soft rock was blaring. 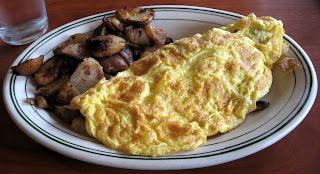 A very large omelette. It was decent, but not great. And since Alexis doesn't eat much potatos or bread, maybe not worth the cost. 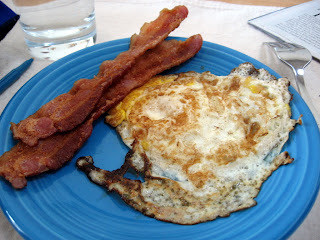 When there is no bacon in the fridge, diced salami makes a nice accompaniment to eggs. The leftovers were quite good, making a perfectly proportioned food-pyramid meal. Tasty, but it certainly smells up the office kitchen. We had some new friends over for dinner. They brought several scotches for tasting and Alexis cooked up a hearty meal that would stand up to the scotches. 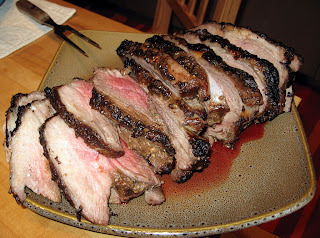 This leg of lamb was marinated for 24 hours, then roasted to a perfectly succulent medium rare. This recipe is as impressive as it is easy. It takes about 5 minutes of hands-on prep time. 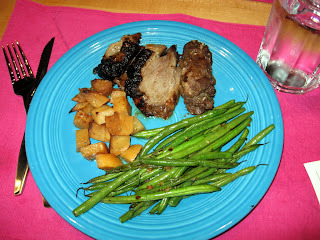 Put the leg of lamb in a large bowl and pour the marinade over it. 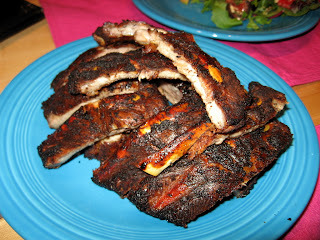 Rub the marinade into every nook and cranny of the boned leg. 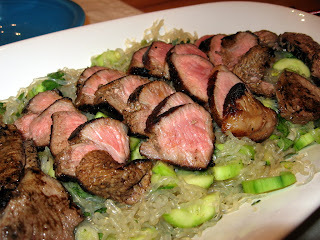 Cover with plastic wrap and marinate for 4 to 24 hours. Place the leg on a roasting pan and roast on 375 until the internal temperature reads 125. (I use an internal electronic thermometer that stays inserted in the middle of the leg of lemb throughout the cooking process. Remove from the oven and let rest for at least 20 minutes. During this time the internal temperature of the lamb will rise to about 135, a perfect medium rare. Fewer carbs and more flavor than potatos. This often over-looked root vegetable is delicious when slow roasted. Coat the rutabaga and with the olive oil and season with salt and pepper. 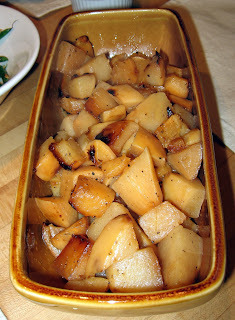 Place the rutabaga in a baking dish and cover with foil. Bake on 375 until tender, about 45 minutes to an hour. Sautee the garlic in the butter and olive oil until just beginning to turn golden. 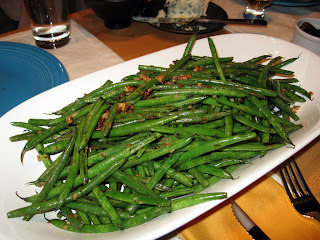 Add the green beans and sautee, moving the beans frequently, over medium heat until the beans are tender and the garlic is browned. Season with salt and pepper. Fruit tarts with a homemade crust are one of the easiest desserts to make. They are quite healthy since I add no sugar, and thus the full flavor of the fresh fruit shines. Mix the cold pieces of butter into the flour with your hands until the mixture resembles cornmeal. Then add water, a tablespoon at a time until you can form it into a ball. Press the dough into a buttered pie pan and push up the sides to create the crust. Pre bake on 350 for 10 minutes, until just beginning to color, and dry to the touch. 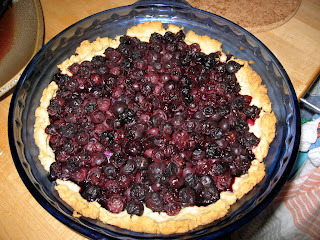 Add the blueberries and bake for another 1/2 hour or so, until the fruit is bubbly and the crust is golden. 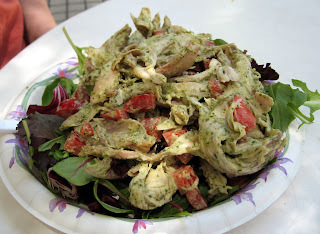 Today Giao ate the pesto chicken salad that Alexis had yesterday. It was still delicious. 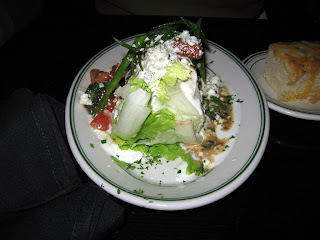 Alexis had a great salad with spinach, grilled tender filet mignon, cucumber, sundried tomatos and toasted pumpkin seeds, all enveloped in a creamy blue cheese dressing. Back to our old standard. 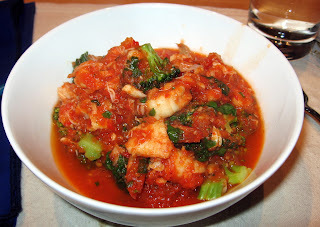 Alexis wasn't quite sure what to make for dinner, but she had a variety of seafood and some brocolli and made a quick stew, seasoned with Thai chili paste, that turned out to be quite tasty. Puree the tomatos, bell pepper, chili paste, garlic and onion in the food processor. Pour the mixture into a large pan and rbing to a boil. Add the seafood and simmer for a minute or so. Add the brocolli and simmer until tender. Season to taste nd sprinkle with chopped fresh cilantro. If we weren't low carb, we'd probably eat this with brown rice. A very yummy dessert, that's (sorta) healthy. A tasty use of a Costco rotisserie chicken. Also, Alexis had a bunch of basil that was going to go bad if she didn't do anything with it, so pesto was the obvious option. 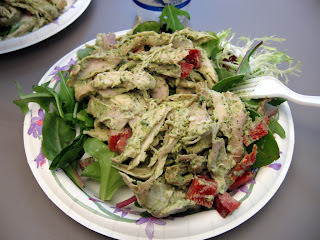 Although you could buy prepared pesto, it is easy and cheap to make at home, as Alexis does. 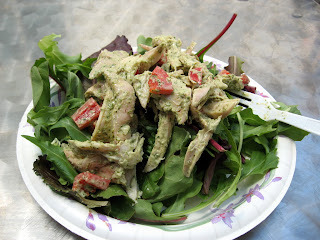 Mix the mayo and pesto until smooth, then mix thoroughly with the other ingredients. Serve on a bed of mixed greens or spinach. 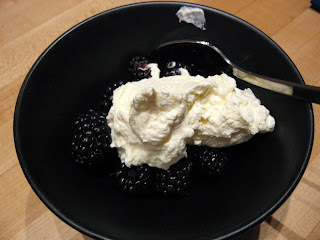 Puree in a food processor and adjust ingredients to your own taste. Giao orders 2, and mixed the meat together in a single bun. 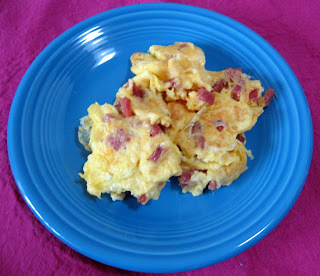 Usually leftovers mixed with eggs, then scrambled make a great breakfast. It turns out that this particular combination of leftovers (cucumbers, noodles in fish sauce, and steak) was not very good for breakfast. Actually, I think it would have been fine without the cucumbers, which were rather odd when hot. Boil the noodles in the chicken broth until tender. 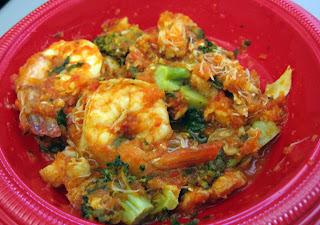 Combine all of the other ingredients in a bowl and set aside for 1/2 hour. Drain the noodles and combine them with the other ingredients. Comfort food. Looks bad, tastes good. Giao is not too sure why he tried the tofu again, but the results were the same as last time. Mmm, home-cooked food again. 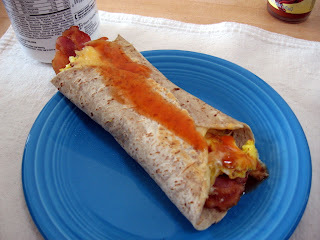 A tasty, protein packed, hand held breakfast. With and hour or so to kill before we had to head to the airport, we decided to check out Portland's largest mall, Lloyd Center. And we chose a place to eat based on the fact that it had a bar and it was not in the food court. It was not very good, but we were not expecting good. Plentiful chicken tenders, but they were a bit soggy and both of the sauces were too sweet. 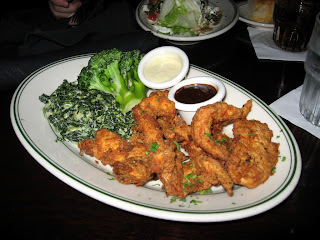 The creamed spinach and brocolli were edible. This dinner was far too expensive for what it was. Not bad and pretty big. The cheese was good, the bread was not. After we'd finished eating our too-expensive-for-what-it-was dinners, we headed to the bar section only to discover that the happy hour offered $2, $3 and $4 appetizers. We weren't really hungry at all, but we had to see how big the $3 cheeseburger was. 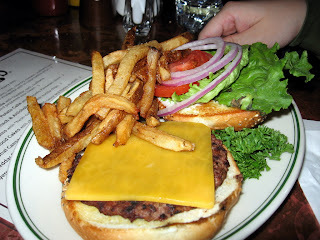 We thought it would be a slider, but, no, it was a full size burger and it was then we learned we'd been royally ripped off in the sit down side of this restaurant. 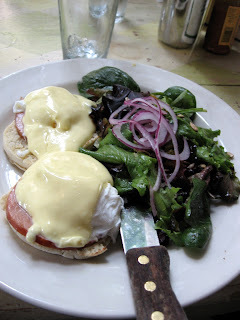 We had a brunch at Mother's Bistro, a place recommended by both our hotel and Alexis' parents hotel (and the local tourist map). It was by far the busiest place we'd seen in Portland. The service was great, very friendly and informative. We do have a bone to pick with who's ever in charge of the pricing. The standard pricing of the meals is fine, it's when you attempt to do substitutions that you get screwed. In general, when you make substitutions at a restaurant, they either don't charge you, or at least tell you what the extra charge will be so that you can make a decision prior to ordering. This place did neither, and then charged unnecessarily exhorbitant sur-charges for our relatively innocuous subtitutions. The full order was $9, so they knocked off $2 and gave us 1/2 the amount. Ridiculous. 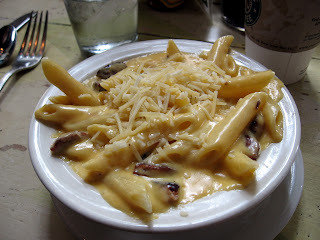 The mac cheese sauce itself was good, but the use of penne was a bit disturbing. Mac n' cheese should be made with elbow macaroni, every time, without fail. Also, we ordered the standard mac n' cheese and were given the one with sausage, which wasn't bad, but we're not sure if we were charged more for that either. Served with the standard breakfast potatos AND toast, this dish would have been only $8.95. 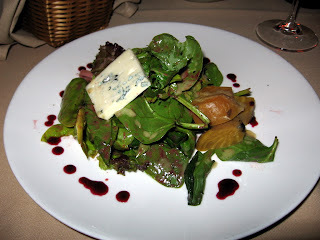 however, because Alexis wanted a few greens instead, they added a $2.50 surcharge. 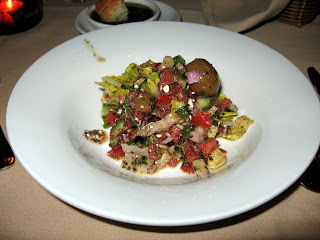 To add insult to injury, the salad was inedible--limp greens, oily dressing and raisins (?!?). 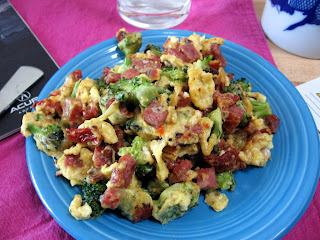 The scramble itself was plentiful and tasty, if a bit salty. 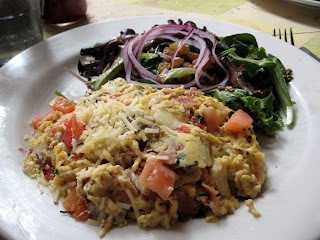 This dish was described by the waiter with such enthusiam we assumed it would be a stand-out. It was good, but not to-die-for. Ditto the above on the ridiculous salad surcharge. This meal would have been $10.95 without that inedible substitution.